BD would like to introduce you to Skye Burkhardt or “BrassyHooker87” as her friends and fans know her. 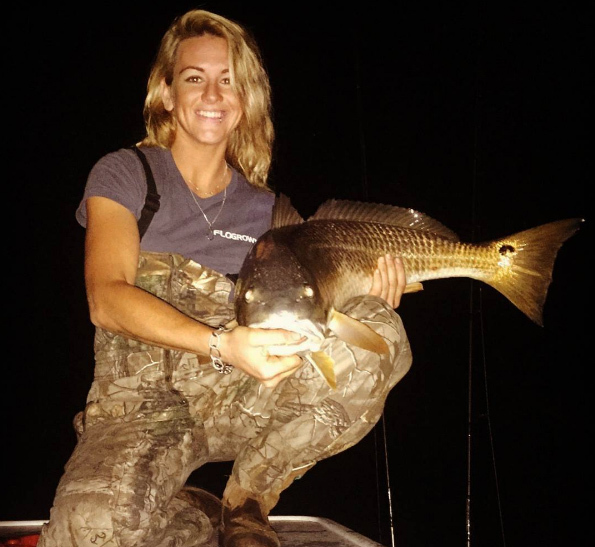 She is very passionate about fishing and shares her perspective with us. Skye Burkhardt: I live in Edgewater, Florida. Skye Burkhardt: I am blessed. I have Mosquito Lagoon in my backyard. I kayak fish mostly. I can walk to my back yard hop in my yak and fish! I fish daily and I’m currently working on my fish art. Skye Burkhardt: Fishing.. Did I mention fishing? I also do yoga and draw fish! 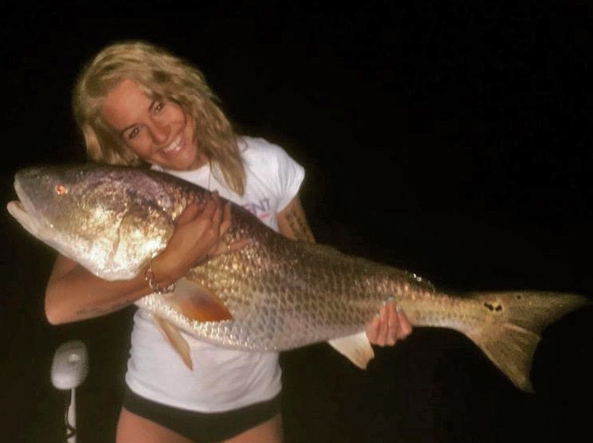 Skye Burkhardt: My father took me fishing when I was a little girl and I fell in love with it. I’ve always wanted to be outdoors and on the water. He said I loved it so much and being that I’m his “Skye Pie” (childhood nickname) he couldn’t say no and loved seeing me so happy. I started out freshwater fishing and then in my teenage years I caught my first gator. This began my gator hunting phase in addition to my bass fishing. 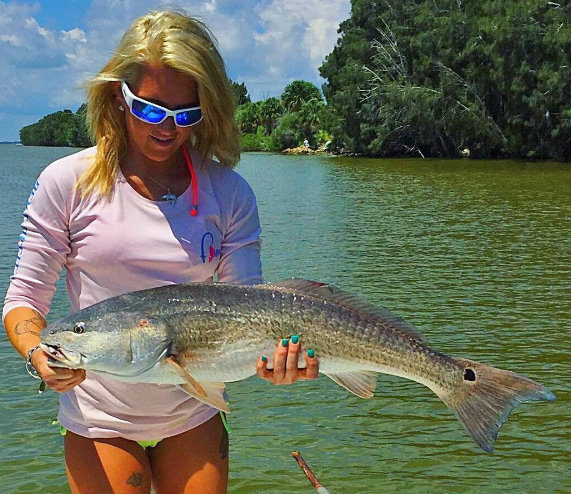 Skye Burkhardt: Saltwater fishing is my favorite hands down! I fished saltwater here and there and then found myself driving to the coast on the weekends to surf fish. I met my husband and his passion for fishing is as strong as mine (almost). One night we went hunting snook and I caught three back to back. I’ve been hooked ever since and I can’t get enough. 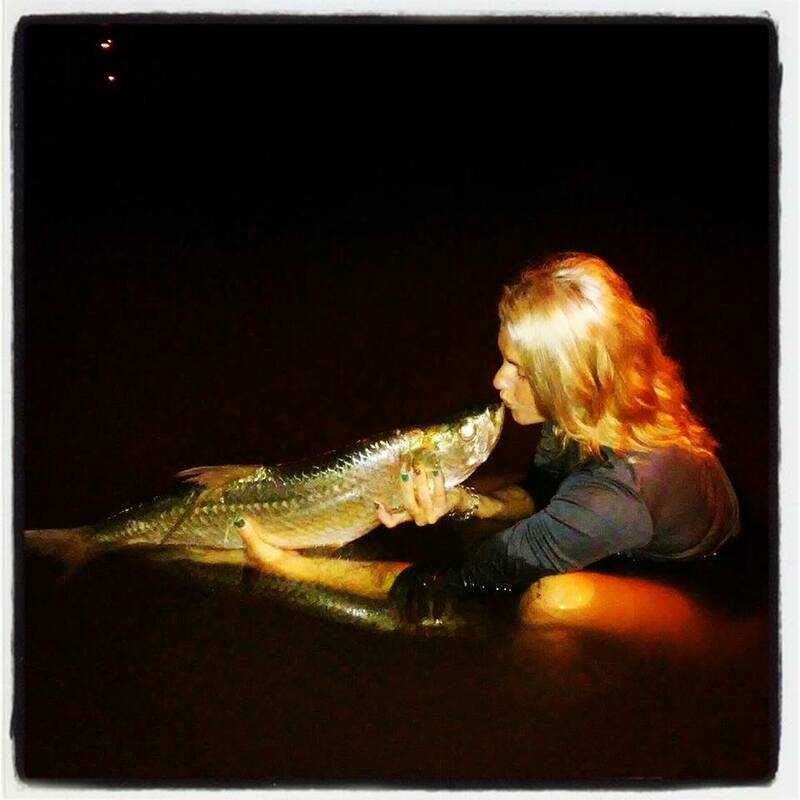 I love to hunt snook because they are such a challenging target and the fight is unreal. They are super finicky eaters so simply hooking one leaves me shaky, my heart pounding and out of breath. They make my heart smile. I share a similar love for tarpon. That would be the second inshore species I target. Redfish just seem to swim to me. Many people refer to me as the “Flats Mermaid”. Recently I was in my kayak when I hooked on to an 80+-pound tarpon that took me for a 4-mile ride against the current and down the channel in the Mosquito Lagoon! It was the most amazing experience, I still feel like I won the lotto! Skye Burkhardt: I’m working on logging enough hours on the water to get my captain’s license. Then my husband and I can start our own inshore charters business. Until then I’m working on kayak fishing tours in the lagoon. Skye Burkhardt: I don’t even know how to answer this. The fact I am so blessed to be able to do what I love on a daily basis is hard to believe! I always feel there is a way to better myself, no matter how much time I spend on the water. So I am always learning new knots and techniques. I love to do it all. I typically use artificials because I enjoy keeping busy rather than throwing bait and sitting and waiting. Getting a fish to bite artificials is very satisfying for me. From the moment I feel my rod thump to the sound of my drag screaming, my heart is racing. My hands shake. I can’t explain the feeling of anticipation, waiting to see my fish and what it looks like. But I have to say I believe my favorite part is seeing her, holding her for a moment, and then watching her swim away. So the release is my favorite part. As an angler I choose to release my fish. I simply fish for the passion and sport. BD: What are some of the proudest moments from your experiences? 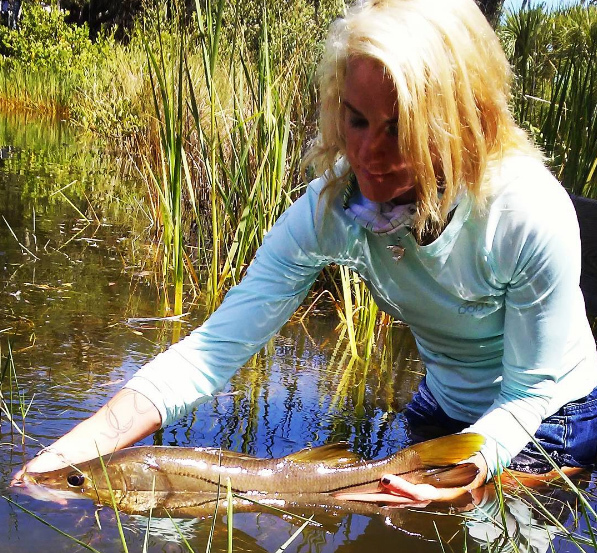 Skye Burkhardt: Well, the three snook back to back in less than 10-minutes using artificial bait! My 50-inch redfish in the Lagoon; what an amazing fight! Another would have to be my first tarpon. The fight is breath taking and watching them go airborne while making sure they don’t throw the hook is beautiful. I teared up during all three of these moments. Being an angler is my passion; a dream I get to live daily. I feel complete and at peace on the water and I love reeling them in and returning these beauties back to their world. You can follow Skye’s adventures on her Inshore Adventures with Skye Facebook page.